You have probably heard many good things about turmeric. Indeed, it has been promoted as one of the most potent and efficient natural weight loss remedy. How exactly can this golden spice can help you get rid of excessive fat and maintain your ideal body weight? According to a 2015 scientific report , turmeric helps weight loss by stopping fat cells growing. 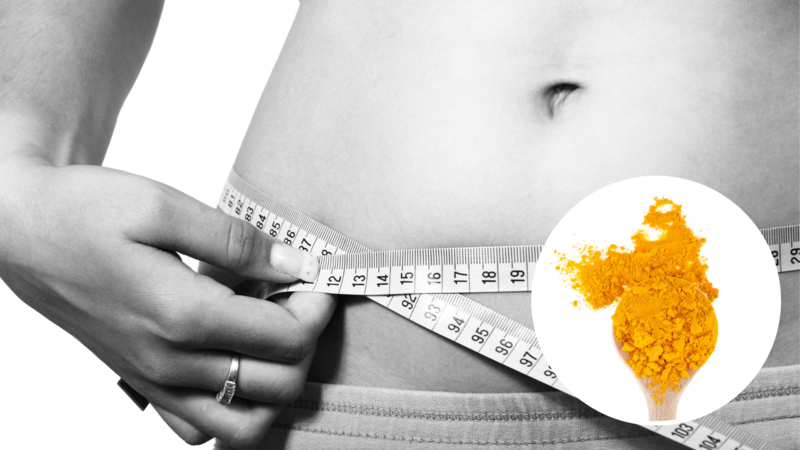 Results of study say the following: consumption of curcumin “increased weight loss from 1.88 to 4.91%, enhanced percentage reduction of body fat (from 0.70 to 8.43%), increased waistline reduction (from 2.36 to 4.14%)”. The reason turmeric may prompt weight loss is that it turns white fat into brown fat, which is burned by the body to release energy, not stored as fat. Regular consumption of turmeric will help you stay in shape. Below we will discuss turmeric benefits and best ways to safely use it for weight loss. But first let’s resolve possible name confusions. Turmeric vs Curcumin: are they the same? The most active component of turmeric is curcumin, which gives the spice it’s bright orange-yellow color. Actually, most of anti-inflammatory, antioxidant, and other prominent power comes not from turmeric itself, but from its active ingredient, curcumin. The two words are sometimes used interchangeably, but the technical difference between the two is that turmeric is the yellowish powder used to flavor foods, while curcumin is a chemical contained within turmeric. In order to get therapeutic effect (or, in other words, significant weight loss effect), you need to realize, that consuming turmeric as spice is not enough. Keep in mind, that only about 3-6% of the weight of turmeric powder is curcumin and curcuminoid compounds that provide most of turmeric’s effects. In order to get enough curcuminoids, high concentrations of curcumin are required which can’t be provided by the amount of turmeric one consumes on a daily basis. 1. Some supplements use a blend of turmeric root powder and extract, typically standardized to contain a certain amount of curcumin or curcuminoids. Look for standardized percentage of Curcuminoids at minimum of 70%. The higher this percentage, the better. If possible try to get turmeric supplements which are standardized to contain 95% of curcuminoids. 2. Unfortunately, curcumin is poorly absorbed into the bloodstream. But mother nature gave us another natural remedy that can deal with this problem. Black pepper, which contains piperine, enhances the absorption of curcumin by 2,000%. The best curcumin supplements contain piperine, which help to increase their effectiveness a lot. 3. Another great addition to turmeric powder is ginger. Ginger increases metabolic rate. helps control motion sickness, alleviates stomach discomfort, alleviates morning sickness, and boosts the immune system. If you would like to shed kilos fast and indulge yourself with warm and spicy drink, here are some recipes of “turmeric milk” (also known as “golden milk”). Golden milk is a beverage that capitalizes on the benefits of turmeric in combination with other healthy ingredients like milk (or coconut milk), ginger and black pepper. The star ingredient in golden milk is turmeric, which gives it a beautiful yellow color and healing benefits. To make the golden milk, simply mix all ingredients in a small saucepan or pot and bring to a boil. Reduce the heat and simmer for about 10 minutes, strain the drink through a fine strainer into mugs and top with a pinch of cinnamon. Get calming and calorie burning effects from this drink made with turmeric, black pepper and ghee. Ghee is a type of clarified butter, which, if you’re also unclear about, is butter that has been cooked and strained to remove water and milk. This blend of 6 superfoods includes organic turmeric root powder, 95% curcumin extract, black pepper fruit, cardamom pods, ginger root, and cinnamon bark. Smells and tastes heavenly with ginger, chai, and cinnamon. You will look forward to your daily cup. Ashwagandha and Reishi can help the body adapt to stressful situations and deal with fatigue and anxiety, while Gingerol (Ginger’s active ingredient), has been studied for its ability to reduce nausea and morning sickness. Try this creamy vanilla scented while cozying up with a good book for the perfect weekend treat. This super-lush turmeric milk blends turmeric and maple syrup with antioxidant-rich ginger. Both matcha and turmeric have been consumed for hundreds of years and offer detoxifying properties, both perform very efficient in terms of antioxidants. Combine these two winning powders together, and you will get extremely powerful cocktail for detoxifying your body and get rid of these sticky extra kilos. This turmeric matcha drink gives you a strong energy kick without a crash or late night insomnia. A delicate turmeric green tea flavour enhanced by ginger & cinnamon. Mix 1/2 a level teaspoon with hot water/milk or add to a smoothie. Find a turmeric drink or supplement that works best for you. For different effects, you can alternate between adding dlack pepper, ginger, apple cider vinegar. As always, stay safe and consult with your healthcare professional in case of any concerns. Potential role of bioavailable curcumin in weight loss and omental adipose tissue decrease: preliminary data of a randomized, controlled trial in overweight people with metabolic syndrome. SEur Rev Med Pharmacol Sci. 2015 Nov;19(21):4195-202.